I would argue that the Czech Republic makes the world's best beers. Many would argue the cases of the Trappist countries of Belgium and Holland or that of the world's biggest beer festival Oktoberfest in Germany. For this reason I went out of my way to find a Czech beer that I hadn't had before, to illustrate the wide variety of beers this country has to offer. This a brewery that I have never heard of before, and I've had alot of Czech beers! 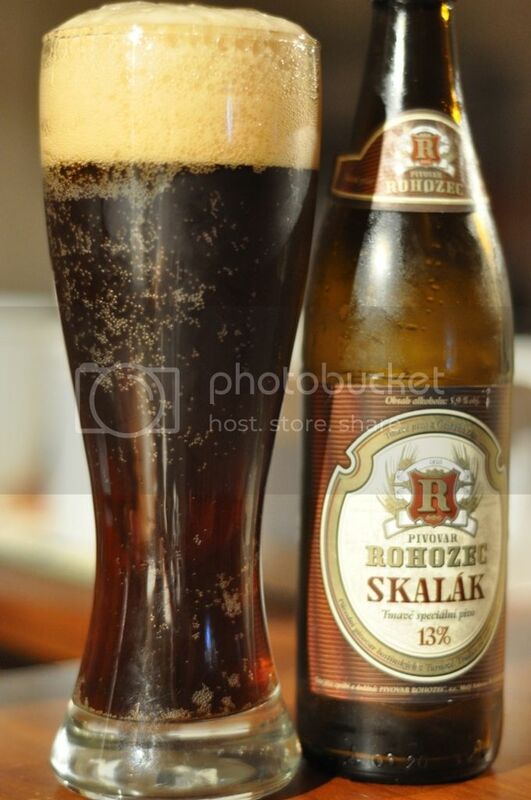 It was established in 1850 but is from Turnov, far away from the brewing hotspots of Prague and Plzen. The 13% you can see on the label refers to the degrees Plato that the beer is brewed at, a common measurement in many central/eastern European countries. The pour is lighter than I expected, it seems to have a significant ammount of carbonation for a dark beer and an excellent looking creamy head. The colour is a dark red colour and is more transparent than most dark beers I've seen. In saying that I haven't had many Euro Dark Lagers so this will be a new experience for me. The head retention is excellent, it may thin out a little but holds it's height until drunk. This beer is very easy on the nose if not a tad sweet. The malts seem incredibly sweet, there is also a great caramel odour. The beer smells mildly of fruit, quite possibly banana or another tropical fruit. I can smell the roasted malts and there appears to be a hint of the Saaz hops that the Czech's are famous for. Overall this is an intriguing smelling beer and I can't wait to try it. Curiosity may have killed the cat; Sweetness definitely killed this beer! My feelings are that the malts aren't roasted enough and are overly sweet for a beer of this style. Far too much caramel in this beer. The body seems very thin, and I am beginning to feel this beer may be confused stylistically. It tastes how a Hefe-Dunkel should taste, but the body just isn't there to pull it off in this beer. If the hops were more pronounced it might save the beer, but there just aren't enough of them. Overall slightly disappointing. I'm slightly disappointed by this beer, if I'm being honest. From my vague recollections of Prague I think the dark beer at U Fleku is a Euro Dark Lager and that is a great hoppy beer. This isn't! My theory on this beer is that either it was marketed to girls, due to the sweetness, or that they don't know how to use hops. Either way I wouldn't buy this beer if I were you, it's just too sweet! P.S. Just to clarify this is the "Tmave specialni pivo 13%" apparently the other beers from this brewery are much better.